Download this white paper and learn the considerations you must make when selecting a B2B managed service provider; how to ask the right questions and understand the answers. Whether due to a lack of technical infrastructure, operational expertise or foresight, organizations are struggling with how to truly maximize their B2B e-commerce potential and attain their supply chain goals. The solution for many is to turn to B2B managed services. 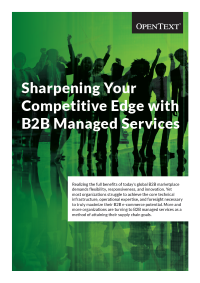 This white paper shows how B2B managed services can improve the capabilities of your business, and explores the issues you should consider when selecting a B2B managed services provider. In making that choice, you need to consider more than the technology but also their process and people capabilities.